I picked up another 21 inch Professional mower last fall. The prior owner used it as his primary mower for well over a decade. He told me she smoked then would not start so he put her on a local Craig’s list. It was located one town over from where I live and since I have a soft spot for Professional models, I took the ride over to take a look. She was a bit rough so I negotiated a better deal and took her home. I met Rocco while he was in the area and gave him the 4hp vertical pull start engine for rebuilding. A few weeks later Rocco informed me the engine was toast. The rod had snapped and cracked the block. Previously I had purchased Rocco’s tricked out 3.5hp engine. As Ibwas mulling over what direction to take with this engine, I looked at all the awesome custom machines that Rocco had created. The idea hit me like a lightning bolt. Why not create a negative image mower with the colors swapped. 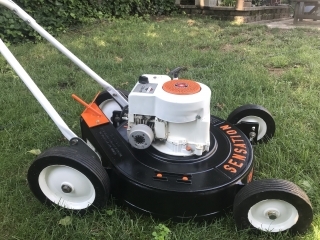 After running my idea past Rocco, as well as picking his brain for details, I began the task of making this mower a “ one off creation”. I swapped the color placement, semi gloss black deck with orange details. Once I got the decals fabricated, the project picked up steam. I located an NOS lower grass deflector to replace the missing one. I put on a set of NOS factory wheels and new blade. 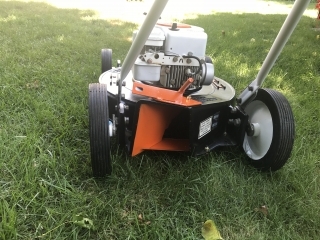 The mower retained the original crank protector and circulat blade shield. The deck and handle bars were striped to bare metal and coated with self etching primer. Rustoleum flat back and Orange were then applied then a few coats of Eastwood semi gloss clear diamond coat was applied. The handlebars GT several coats of Rustoleum semi gloss white. I located a real nice grass catcher that just needed a good cleaning to complete it. I think she turned out great! She will share primary lawn care duty with my other Professional. Actually, I’m not happy with the orange paint I used on my other mower so I’ll be repainting it in the near future. Rocco, thanks for the inspiration and support to creat this! I wouldn’t and couldn’t have done it with out your help! !